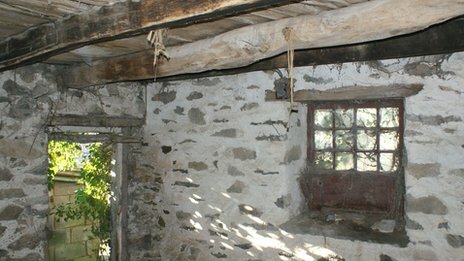 Plas Tirion (G-B) : Oldest house in Wales? Could Plas Tirion's cow shed be oldest house in Wales? A project to find the ages of historic buildings by dating their timbers may have found one of Wales' oldest homes. Experts say new evidence shows north west Wales was an innovative place architecturally with cutting edge houses built in the 16th Century. They are awaiting results on an "unremarkable" building in Conwy, now a cow shed, which may pre-date Wales' oldest homes from 1402. Specialists and volunteers are using tree ring dating or dendrochronology. They say that architectural features give a rough guide to the date of a house, but these are sometimes altered when design tastes change over the years. But tree-dating old timber frames can give a clear picture of when a property was first built. 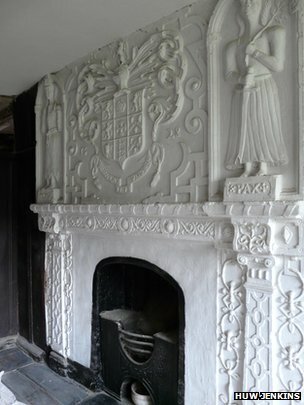 A project was established by enthusiasts in 2008 to discover more about the history and development of 16th and 17th Century Tudor and Jacobean houses in north west Wales. Since then they have been working with experts including specialists at the Royal Commission on the Ancient and Historical Monuments of Wales (RCAHMW). More than 200 properties have been examined and about 60 have been successfully dated using dendrochronology with the full results due to be published once the project ends in April. The volunteers have been conducting separate research of historical records into all those houses. And architectural historians have also produced surveys on the same properties with the oldest, so far, found to be buildings on Castle Street, Beaumaris, which date to 1482. However, results are eagerly awaited on one property in particular. The style and use of a cruck frame - a tree trunk used to support a roof - leads some specialists to think a building used as a cow shed and store near historic house Plas Tirion, in Llanrwst, Conwy, could pre-date Wales' oldest domestic houses such as Hafod-y-Garreg in the Wye Valley, which dates to 1402. Dendrochronology tests were carried out last week on the cow shed and the results will not be back for some weeks. "We're looking forward to getting the results, hopefully at the end of March," said owner Sophie Scharer. "We're very excited to be involved with the dating old houses project." Experts became interested because the shed - thought to have once been a house due to blackened timbers suggesting a fire was regularly burned below - uses two separate trunks as a cruck frame. That was the style used prior to the 1400s and which has been found in England, but not in Wales where only post-1400 properties have been found using a single trunk split in two. Project members are keen to know if this could make the building the oldest dated domestic property in Wales - although some buildings such as churches are older. Senior historic buildings investigator Richard Suggett from the RCAHMW said: "It's an unusual form of construction, which in England can date from the 14th Century. He explained that tree ring dating is "the only way to establish an accurate chronology for building". "I think it is fair to say that it is transforming our understanding of building history and hence social history," he said. "Architectural historians thought north west Wales was a back water. "We now know it was an innovative place and some of the most up-to-date architecturally exciting houses were being built here in the first half of the 16th Century." Mrs Scharer's husband Ned, who works in building conservation, said even after the test results were back, they may never know for sure if the building was the oldest. He said the fact that the building was "unremarkable", having been used as a cow shed and store, was probably the reason it survived. The couple bought Plas Tirion, a local landmark, three years ago and have started restoring the property which includes highly decorative plasterwork from the 17th Century. Dendrochronology obtains the felling date of a tree by tree-ring dating. It measures the variation in width of a tree's annual growth rings as influenced by climatic conditions. The variations in widths allow calendar dates to be compared with existing data. A tree section has to be complete from the bark edge for a precise felling date to be determined. A narrow core is extracted from across the annual growth rings of the timber. As seasoned timber was too hard to work and shape, unseasoned timber was used in houses built before c.1650.